Doubts have been raised about Israel's denial of military responsibility for the deaths of eight Palestinians relaxing on a Gaza beach last Friday. 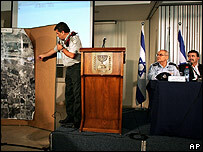 Investigator Gen Meir Klifi had said it was unknown what caused the blast, but hinted it was a Palestinian-laid mine. In a later interview he again ruled out Israeli shelling but said old Israeli munitions could have been to blame. Palestinians dismissed Israel's claims and are calling on the United Nations to hold an independent investigation. The deaths of eight civilians on a beach near Beit Lahiya - seven of whom belonged to the same family and three of whom were children - sparked worldwide condemnation of Israel. The militant group Hamas, which heads the Palestinian government, ended an informal ceasefire and fired dozens of home-made rockets at Israel, causing panic and several injuries. In a high profile rebuttal on Tuesday, Israeli Defence Minister Amir Peretz and Chief of Staff Dan Halutz appeared alongside Gen Klifi to announce the findings of an internal military enquiry. "The chances that artillery fire hit that area at that time are nil," Gen Klifi told journalists. Mr Peretz added that "the intention to describe this as an Israeli event is simply not correct". "This shrapnel was not from a 155mm [shell]... there is no doubt on this point. "It could be from another kind of munition that we have used in the past or a non-Israeli device, but we have not finished the work of the inquiry," he added. 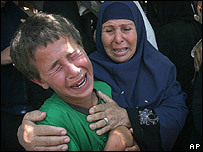 Chief Palestinian negotiator Saeb Erakat urged the United Nations to launch its own investigation. "The Israeli escalation in Gaza and the large number of martyrs should force the UN and international community to increase their efforts to protect the civilian Palestinian population," he said in an interview with AFP news agency. Israel frequently bombards northern Gaza, targeting militant rocket crews who attack nearby Israeli territory. On Tuesday, 11 Palestinians including nine civilians were killed in an Israeli missile attack on a vehicle carrying militants on their way to fire rockets. General Yoav Galant, head of the army's southern command, expressed regret over the civilian deaths. One Israeli suggestion for Friday's blast has been that it was caused by a mine laid by Hamas militants, but this was dismissed by a bomb damage expert who visited the scene. Mark Garlasco, working for the US-based Human Rights Watch group, said victims' injuries were not consistent with explosives blowing up in the sand beneath them. "My assessment [is] that it's likely that this was incoming artillery fire that landed on the beach and was fired by the Israelis from the north of Gaza." The Israeli military says its investigation used TV footage of the aftermath of the explosion and shrapnel recovered from victims being treated in Israeli hospitals. Six shells were fired in the area, but the army said their timing and location did not match that of the blast that killed the beach-goers.